Minion Miniatures is running a Kickstarter campaign for their Monsters of the Underdeep set of minis. They're already more than 2x funded, so it's on to stretch goals and extras for the next 29 days. The "Monsters of Underdeep" Kickstarter brings to life the larger denizens of the Underdeep like the hulking Bugbear Ironshield and the freakish Flesh Golem. The purpose of this Kickstarter is to bring the world of Morn to life and enable us to invest more funds into the designing and manufacturing of our core factions for our Underdeep game. We plan to release the first faction; Goblin-kind in Spring/Summer 2015, after we have fulfilled this Kickstarter. 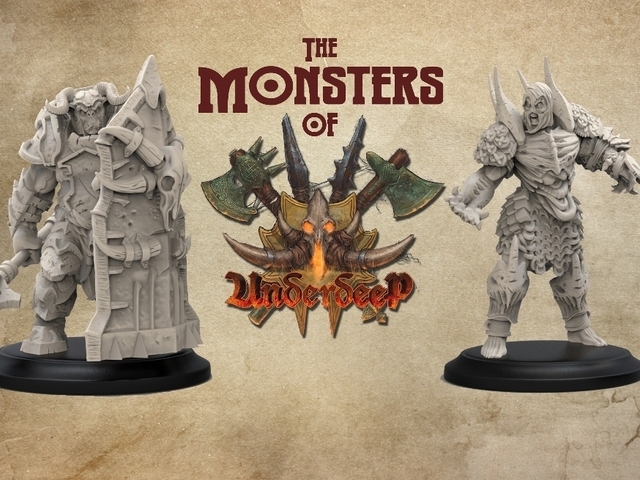 The Monsters of Underdeep Kickstarter allows you to pledge toward the manufacture of our range massive 28mm scale, high quality resin miniatures. These figures are not for the faint-hearted with the average model standing at around 55mm to its eyeline.